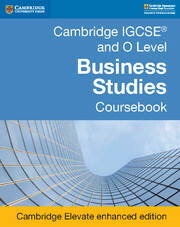 Build confidence during exam preparation with Cambridge IGCSE® and O Level Business Studies Revision Guide. 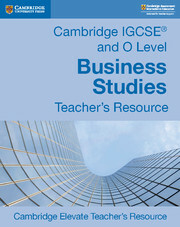 This comprehensive resource contains specially designed guidance to help students apply their knowledge and skills. 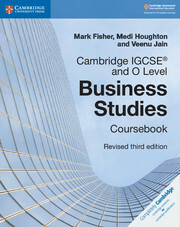 Written in a clear style by examiners, this revision guide is perfect for international learners and accompanies the Cambridge IGCSE and O Level Business Studies Coursebook, revised third edition. 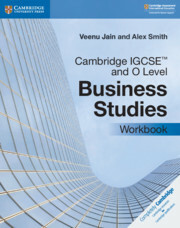 Answers to revision guide questions are at the back of the book, so students have the freedom to build their skills in the classroom and at home. 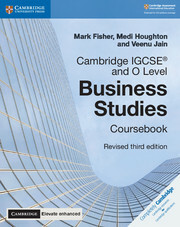 Concise and straightforward coverage of the syllabus content aids revision. Progress Check questions help students test their knowledge and understanding, which aids retention as they work their way through the book. Definitions of key terms alongside relevant text help international learners with business words and phrases. Chapter summaries review each chapter and allow you to track revision. Exam-style questions at the end of every chapter help build confidence. 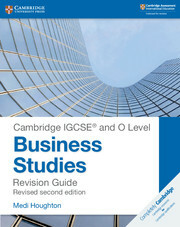 Answers to the revision guide questions are at the back of the book.